This is the eleventh post on a series about the Preview 4 of WCF Web API. The sixth post, entitled WCF Web API–Processing Architecture, presented Web API’s runtime architecture, introducing several key architectural elements, namely message handlers and operation handlers. The last post described message handlers in more detail. In this post, the focus goes to operation handlers. Operation handlers are a WCF Web API extensibility point located after an operation is selected by the dispatcher, but before the operation’s method is called, as shown in the following diagram. 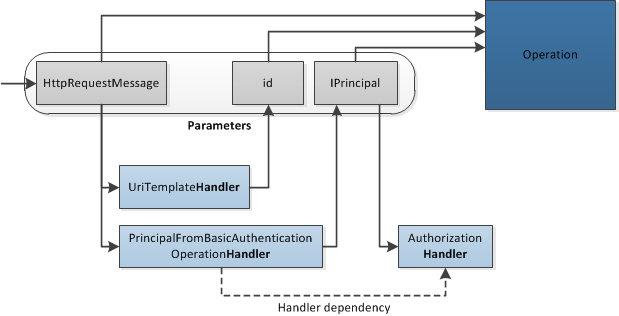 There is only one message handler pipeline, where each handler can execute before and after the operation’s invocation. However, there are two operation handler pipelines. The first, called the request pipeline, is composed by the operation handlers executed before the operation’s invocation. The second, called the response pipeline, is constituted by the operation handlers executed after the operation’s call. This characteristic is also visible in the above diagram. A message handler receives a HttpRequestMessage. An operation handler receives a set of HttpParameters, dynamically defined at startup. A message handler asynchronously produces an HttpResponseMessage, by returning a Task<HttpResponseMessage>, which is typically completed after the operation was invoked. A request operation handler synchronously returns a set of HttpParameter, before the operation is invoked. This HttpParameter set is also dynamically defined at startup. A message handler can completely ignore the inner message handler, short-circuiting the operation’s invocation, and producing an HttpResponseMessage directly. The only way for an operation handler to short-circuit the call to the operation is by throwing an exception. The OnGetInputParameters method returns a sequence of HttpParameter, defining the parameters that must be provided to the handler, i.e., the parameter names and types. The OnGetOutputParameters method returns a sequence of HttpParameter, defining the parameters that are provided by the handler. The above two methods are called only once, at startup. The third method, OnHandle, is called per request. It receives the input parameter values, declared by OnGetInputParameters, and returns the output parameter values, declared by OnGetOutputParameters. Since the operation handler’s contract is dynamically defined by the two first methods, and not defined at compile time, the input and output type is object. However, WCF Web API contains a set of generic classes, such as HttpOperationHandler<T, TOutput>, where the input and output types are statically defined and the OnGetXxxxParameters methods are already implemented. The UriTemplateHandler receives a HttpRequestMessage and returns the extracted URI templates variables for the operation. The RequestContentHandler receives a HttpRequestMessage and returns a typed HttpRequestMessage, using a MediaTypeDecoder to convert from the content bytes into an object. The following code excerpt shows a demo operation handler that inserts all the input parameters into the trace output. This handler receives exactly the same parameters as the operation’s method. This is accomplished by using the HttpOperationDescription to obtain this information and return it on the OnGetInputParameters. This handler has no output parameters. The OnHandle method receives the operation’s input parameter values and writes them into the trace output. Since the input parameter collection is not known in compile time, this operation handler derives directly from HttpOperationHandler and not from one of the generic overloads. The following code excerpt shows another example of an operation handler. This one extracts the user’s identity from the request’s headers, creates an IPrincipal and adds it as an parameter. This class derives from the genericHttpOperationHandler<HttpRequestMessage,IPrincipal>, since the input and output are known at compile time. The constructor calls the base constructor defining the output parameter’s name. The OnHandle method uses the Authorization header to extract the user’s identity, assuming that it was already validated (by the WCF runtime or by a message handler, see this post). With message handlers, the execution order equals the configuration order. However, with operation handlers things are different. Since there could be handlers that need the output of other handlers, the execution order must satisfy this parameter dependency. For example, consider an handler that receives an IPrincipal and uses it to evaluate an authorization policy. This handler must be executed after the above PrincipalFromBasicAuthenticationOperationHandler, in order to receive the user’s identity. On startup, the WCF runtime uses the input and output handler information (via the OnGetInputParameters/OnGetOutputParameters methods) to compute a permutation of the configuration order that satisfies the input-output dependencies. If such an order doesn’t exists, an exception is throwed when the service starts. The following diagram illustrates these dependencies. The call to the base.OnCreateRequestHandlers, so that the built-in handlers are also included in the collection. The conditional addition logic, using service description information from the ServiceEndpoint and from HttpOperationDescription: the PrincipalFromBasicAuthenticationOperationHandler is only added if the operation requires an IPrincipal and the binding is using HttpClientCredentialType.Basic. A response operation handler for JSONP support, by Alexander Zeitler. Configuring your WCF APIs, by Pablo Cibraro. Message Handlers vs Operation Handlers which one to use?, by Glenn Block. This entry was posted in Software and tagged WCF Web API on August 13, 2011 by pedrofelix. This is the tenth post on a series about the Preview 4 of WCF Web API. The sixth post, entitled WCF Web API–Processing Architecture, presented Web API’s runtime architecture, introducing several key architectural elements, namely message handlers and operation handlers. In this post, I describe message handlers in more detail, presenting some examples and a set of external resources on this subject. The same message handler instance is used for all the operations, i.e., all request URIs and HTTP methods. Namely, the handler doesn’t have access to the dispatching result – the final operation. However, there are different message handler instances per endpoint. The message handler only has access to the request message and not to the operation’s parameters. On initialization, each message handler receives a reference to a inner handler. On request processing, each message handler receives the request and is responsible to produce a response, eventually delegating that task to the inner handler (in Preview 4 message handlers are still called delegating handlers). However, message handlers don’t use a synchronous model. Instead, they use an asynchronous model, based on the Task<T> class: instead of returning a HttpResponseMessage, a message handler must return a Task<HttpResponseMessage>. This means that message handlers are an adequate extension point to insert lengthy I/O requests. On Preview 4, a message handler is a class that must derive from DelegatingChannel and overrides the SendAsync method. A message handler doesn’t even need to call the inner handler. Namely, it can completely bypass the upper WCF runtime stack. The following code excerpt shows a message handler prototype that simply forwards all the HTTP requests to the origin server, using an HttpClient object. 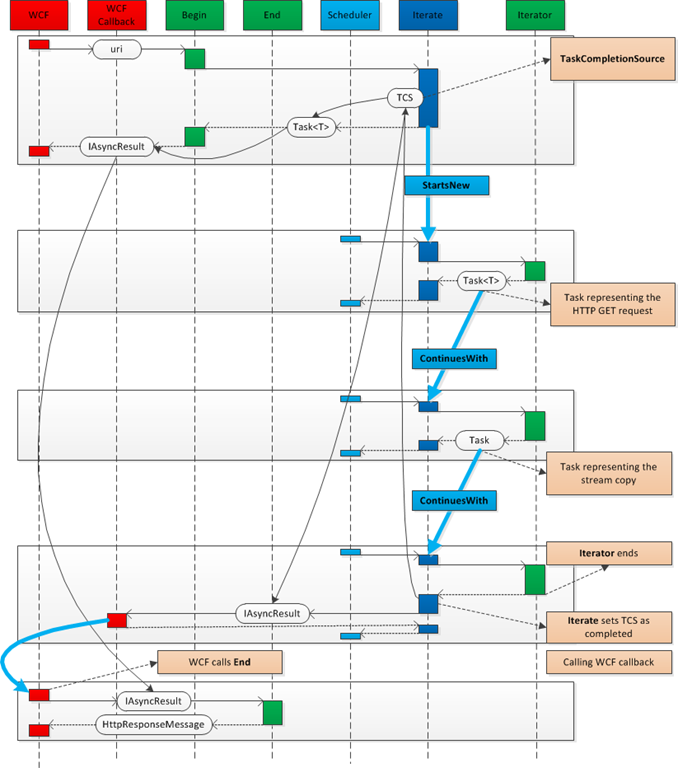 It illustrates a simplistic way of implementing HTTP intermediaries (e.g. proxies). Message handlers can be configured via a HttpHostConfiguration class and the AddMessageHandlers method. This is illustrated in the following code excerpt. Notice that ProxyMessage handler is the inner handler of ElapseTimeMessageHandlers. An introduction to message handlers, by Pablo Cibraro, with a very interesting API key verification example. Differentiation between message handlers and operation handlers, by Glenn Block. Automatic ETag Management with WCF Web API Message Handlers, on Channel 9. Supporting HEAD and TRACE, by Darrel Miller. This entry was posted in Software and tagged HTTP, WCF Web API on August 9, 2011 by pedrofelix. In this post, I show how to handle HTTP requests asynchronously. The Begin method receives the operation’s inputs and two extra parameters – an AsyncCallback and an object state. This method must return an IAsyncResult, representing the asynchronous operation. The APM model is used in several places of the .NET platform. Some examples are stream reading and writing; and asynchronous delegate invocation. On the client-side, the generated proxies can expose each WCF operation as a Begin/End method pair. On the service-side, the implementing class may expose a Begin/End method pair that will be called asynchronously by the WCF runtime. The usage of the asynchronous model is defined by the AsyncPattern property assigned with true on the OperationContract attribute. More details about the AsyncPattern in “classical” WCF can be found in the following post series: WCF and the AsyncPattern property. No need to call an End operation to retrieve the result. Instead, this value can be obtained from the task itself. Better support for cancellation, through cancellation tokens. Better support for exception handling. Native support for asynchronous operation composition, via the ContinueWith and the ContinueWhenAll/ContinueWhenAny methods. The announced C#async support is also based on the Task<T> model and will provide a language integrated way of building and composing asynchronous operations. The new .NET’s HTTP client (HttpClient class) provides a set of XxxAsync methods, returning Task<HttpResponseMessage>, for performing asynchronous HTTP requests. The WCF Web API message handlers, briefly described in the sixth post of this series, also use the new Task<T> model. Unfortunately, the Preview 4 of WCF Web API doesn’t yet support the Task<T> model for the operation implementation. However, it is not hard to implement a APM based interface using Task<T>, as described in the following reference: TPL and Traditional .NET Asynchronous Programming. The key fact is that the Task<T> class also implements the IAsyncResult interface. Obtaining the response to the GET request and all the associated representation bytes may take a significant time. In order to avoid keeping a thread blocked during this time, this operation’s implementation will be asynchronous. The previous code excerpt presents the BeginGetImage and EndGetImage methods. The operation core processing is started on line 9, using a iterator based technique described in the following section, and is represented by a task. On line 10, a continuation is added to the above task, so that the WCF callback is called when the task completes. This will trigger the call, by the WCF runtime, of the EndGetImage method. On line 15, the task created on line 9 is returned. Notice that the operation’s return type is IAsyncResult. However, as stated in the beginning of this post, the Task class implements IAsyncResult interface. This is the key aspect to translate from the Task model into the APM model. The other aspect is the use of the state parameter when creating the task. On line 21, the IAsyncResult is casted to a task. Notice that, according to the APM, the IAsyncResult passed into the End method is the one returned by the Begin method. Finally, the _exception and _response instance fields are consulted to produce an exception or response. These fields are assigned by the asynchronous process started on line 9 of the Begin method, as described in the following section. Notice that the above code is rather generic. It could be used to implement other operations, just by changing line 9. The typical way of defining asynchronous behavior with the Task<T> model is by chaining tasks with actions, producing other tasks. This breaks the code into multiple methods/anonymous methods/lambdas, reducing the readability. In this post, we use an iterator based technique proposed by J. Richter for the APM and adapted to the Task<T> model by the ParallelExtensionExtras. The following code excerpt shows the asynchronous processing of the GetImageAndConvertItToJpeg method, implemented as a C# iterator. An HttpClient is created to retrieve the upstream image. If any exception occurs while creating and starting the request, then the _exception instance field is assigned with an HttpResponseException and the iterator stops (yield break). If not, the result of the client.GetAsync(uri) statement is a Task<HttpResponseMessage>, representing the HTTP request. This task is then returned by the iterator, without blocking the hosting thread. The iterator is resumed only when this Task<HttpResponseMessage> completes. Then it checks for errors, and if everything is ok, creates a task to copy the HttpResponseMessage’s stream into a memory stream. This is done to ensure that all the image’s content are in memory when the bitmap is created. If the bitmap was created directly from the HttpResponseMessage’s stream, then the Bitmapconstructor would block the hosting thread while waiting for all the bytes (and we don’t want to block threads! ).The stream copy uses the CopyStreamToStreamAsync extension method, also available on the ParallelExtensionExtras. The task returned by this method is then returned by the iterator, so that the stream copy is performed asynchronously. The iterator is resumed again when the stream copy completes. After some error checking, the Bitmap is finally created and saved into another memory stream used in the response message. Notice that this can be done synchronously, since it doesn’t require any I/O. Unfortunately, the above code is slightly cluttered by the error handling and by the fact that a yield statement cannot be inside a try-catch block. The chaining of the tasks returned by the above iterator is done by the ParallelExtensionExtras Iterate method, that wraps the overall resulting asynchronous processing in a Task (remember line 9 of the second code excerpt). When initially called, the Iterate method schedules a task, using StartNew, that will call the iterator to retrieve the first task. It also creates a TaskCompletionSource to represent the overall task. The first task retrieved from the iterator (representing the HTTP request) is then chained with another call to the iterator, using a ContinueWith. The second task retrieved from the iterator (representing the stream copy) is also chained with another call to the iterator. The final call to the iterator doesn’t return any element (MoveNext returns false), so Iterate signals the TaskCompletionSource that all the work is completed. This results in the call of the WCF callback. The following diagram presents a sequence diagram, with the interaction between the different components. Currently, WCF Web API only allows asynchronous operation implementations exposing the APM model. However, it is not difficult to use a Task<T> based model with an APM interface, using the fact that Task implements IAsyncResult. While the future C# 5 asynchronous support is not available, the use of iterators and the ParallelExtensionExtras’s Iterate method provides for a similar experience. In this post I was not concerned with measuring the scalability improvements due to the use of asynchronous operation implementation. Namely, asynchronous processing may be disadvantageous if the blocking time is very small. My main goal here was the how and not the why of using asynchronous processing. The ParallelExtensionExtras library is full of interesting utilities, of which the Iterate and the CopyStreamToStreamAsync are just examples. Finally, feedback is greatly welcomed. This entry was posted in Software and tagged concurrency, TPL, WCF Web API on August 5, 2011 by pedrofelix.